Esky -- Electronics Sky Esky Basic No bark control collars The time you spend with your pet is precious, and you love having her in your life. When it comes to her behavior, you have very few complaints. Yet, there is one small issue you would like to fix her constant chatter. Lately, her barking and yapping has become the soundtrack of your life. 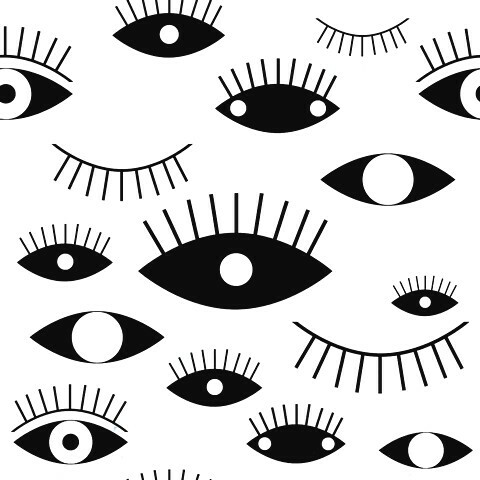 It is'n exactly music to your ears, and you're ready to do something about it. The Bark Control Collar is an easy-to-use solution that will tune out her barking. How it works: When your dog barks, the vibration of your dog's bark triggers the sensor probe. The collar then administers a static correction through the contact points. It begins with the lowest level of correction and increases through the six levels each time she barks within 30 seconds of the previous barks. Once she stops, the collar will reset itself to the lowest level. When she barks again, the process will start over. Along with each static correction, the collar will also beep. Static correction is a very mild tingle, and the collar adjusts the correction based on your dog's temperament. She will quickly learn not to bark when the collar is on. As an added safety feature the Bark Control Collar will automatically shut off for 3 minutes if your dog barks 15 times or more within 50 seconds. When using your Bark Control Collar for the first time, fit the adjustable strap to your dog and wait nearby until your dog barks. Most pets will quickly understand the new sensation is telling her to be quiet. Esky -Sky of Electronics Esky EP-300R-B1 has been proven safe, comfortable, and effective for all pets over 15 lbs. It assists you in controlling your pet without a leash in a range up to 300m. 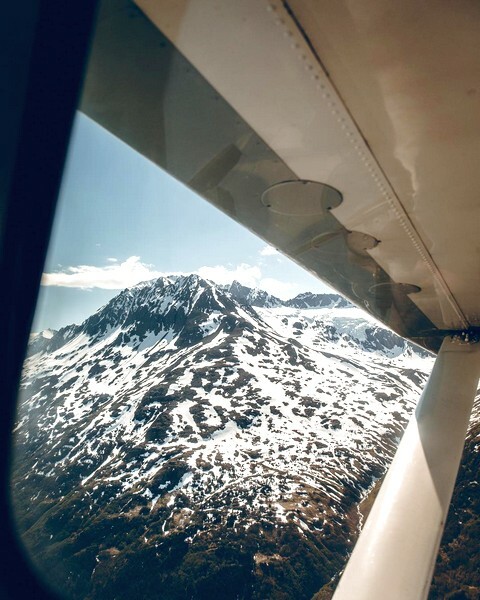 At the push of a button, the remote transmitter sends a signal, activating the collar-receiver. Using the remote trainer consistently and correctly, most misbehaviors that your pet exhibits can be corrected or any basic obedience commands taught. It can also be used to deter such unwanted behaviors as jumping up, digging and chasing. 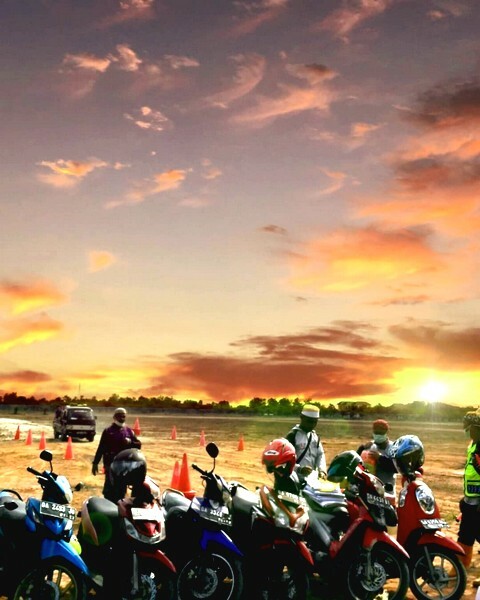 Simultaneous charging for transmitter and receiver is achieved on the new version. 1 second to turn on/off (instead of 5 seconds in previous version)---No corrections missed again! New edges of the receiver: - Drop-proof design - TPU belt with more durability - Improved charging mechanism - More water and dust proof Package includes: - 1 x Remote Transmitter - 1 x Collar Receiver - 1 x Adjustable TPU Belt - 1 x USB Charging Cable - 1 x Charger - 1 x Battery - 1 x Test Bulb - 2 Set of Metal Probes About the waterproof - Water resistance Level: IP3(Can withstand water equivalent to 0.7 liters per minute if the lid is secured properly) - The collar can be worn in light drizzles but must be removed before bathing or swimming - Please note that submerging the collar in water WILL cause damage This is the upgraded version of our hot seller B004DMV1BI. Search "B004DMV1BI" on Amazon for the details. 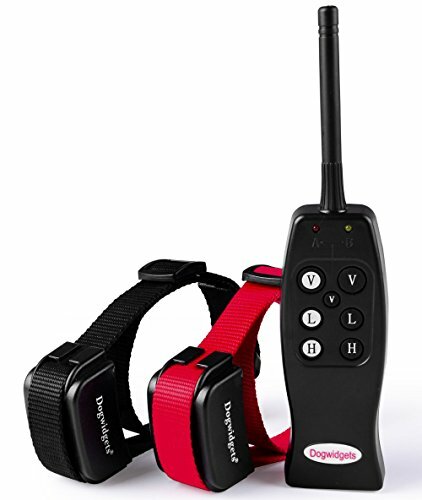 The latest remote control dog training shock collar for 2 dog from Dogwidgets. This training collar can train 1 or 2 dogs individually or train them both at the same time with shocks and vibration. 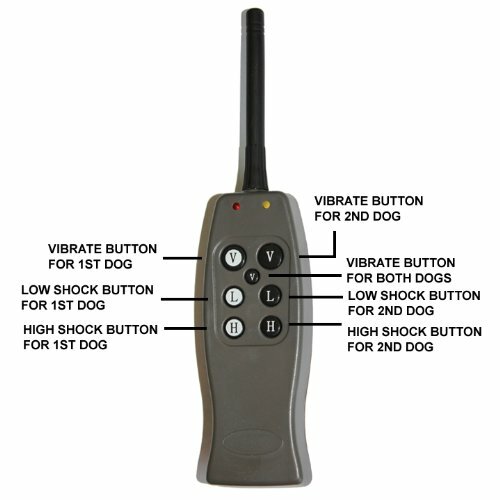 Control the 1st or 2nd dog with a shock or vibration or control both dogs at the same time with the vibration. Collar water-resistant(not waterproof)is rechargeable and has a 600 feet range. Use this collar for basic training, obedience training or curbing excessive barking. This set includes: 2 rechargeable collars, 2 straps adjustable from 10 to 20 inches long, 1 wall charger, 1 USB cable, 4 sets of prongs(rubber and metal), 1 user manaul and 6 months warranty. 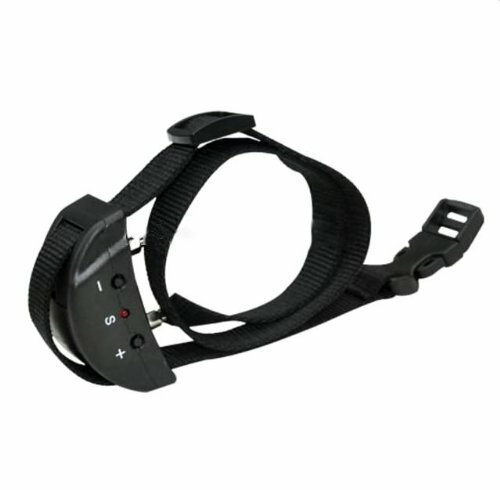 Replacement collar for Dogwidgets DW-1. The set contains 1 receiver, 1 strap, 2 rubber prongs, 2 metal prongs. 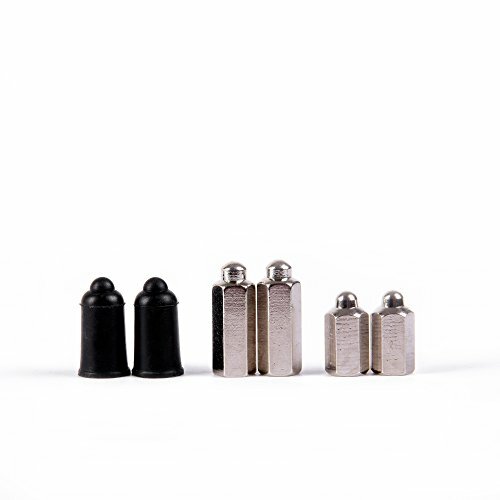 Replacement rubber prongs and metal prongs for Dogwidgets dog shock collars. Compatible for the following model: DW-1, DW-2, DW-3, DW-5, DW-6, DW-15, DW-16 dog training collars. Don't order this replacement prongs if your dog training collar is not the Dogwidgets brand as it will not fit or compatible with other brands. Latest model Dogwidgets DW-5 2 dog training collars. Collars has 2 levels of shocks and 1 level of vibration and has 600 feet range. Collar will work with small, medium and large dogs from 15 to 100 lbs. You can train your dog individually with a shock and vibration or correct your 2 dogs at the same time with a vibration. Very safe and humane. 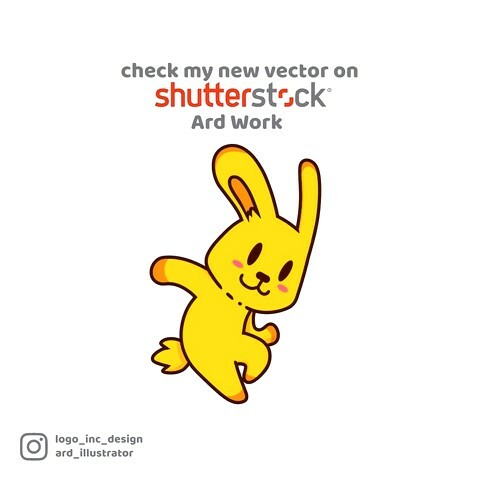 Product Features: 2 levels of shock(Low and High). 1 level of strong vibration for each dog. Correct 1 dog with a shock or vibration or correct both dogs at the same time with a strong vibration. The set contains: 2 straps adjustable from 12 to 20 inches long. 2 rechargeable receivers. 1 transmitter(9-volts battery included). dual charger for the 2 receivers. 2 sets of rubber and metal prongs for the receivers. 2 shock tester and user manual. 6 months warranty and fast technical support from DogWidgets. Replacement collar for Dogwidgets DW-3. The set contains 1 receiver, 1 strap, 2 rubber prongs, 2 metal prongs. 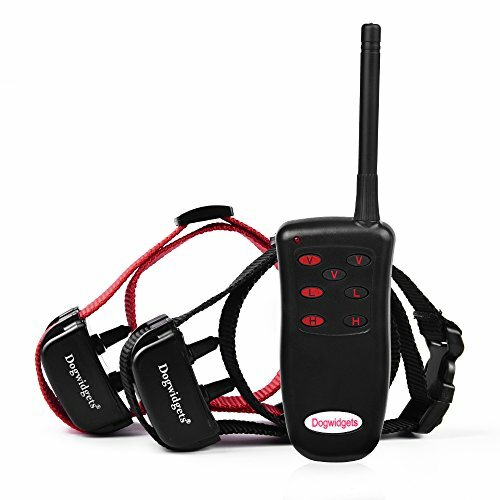 New model Dogwidgets DW-6 Remote 1 dog training shock and vibration collar by Dogwidgets. Collar has 6 different momentary shocks and 1 level vibration and up to 600 feet range. Collar will work with small, medium and large dogs weighing from 15 to 100 pounds. Use this training collar for basic training, potty training, biting, jumping on people, chasing cars, running away and barking. Very safe and effective. 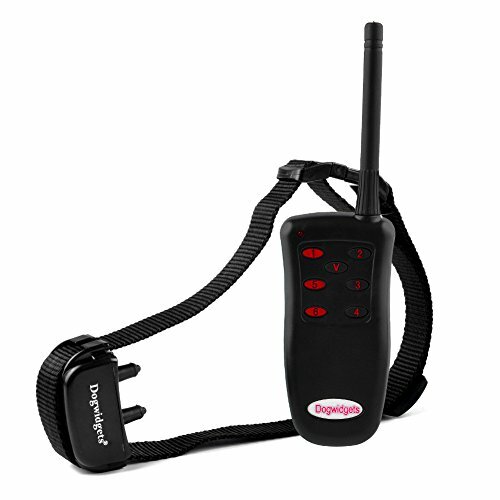 Collar features: Compact design remote control operation with 7 buttons for shocks and vibrations. No need to toggle/switch buttons to deliver vibrations and shocks. 6 different levels of shocks. 1 strong vibration stops dog's bad behavior 99% of the time. Up to 600 feet range Rechargeable water-resistant collarreceiver(Not Waterproof). Durable collar receiver with power on/off button The set contains: 1 remote control(9-volt battery operated) 1 rechargeable collar receiver 1 collar adjustable from 12 to 20 inches long 1 wall charger and USB cable for the collar 1 shock tester bulb 2 rubber prongs 2 short metal prongs and 2 long metal prongs for long haired dogs 30 day money back guarantee. 6 months replacement warranty and fast technical support from Dogwidgets. 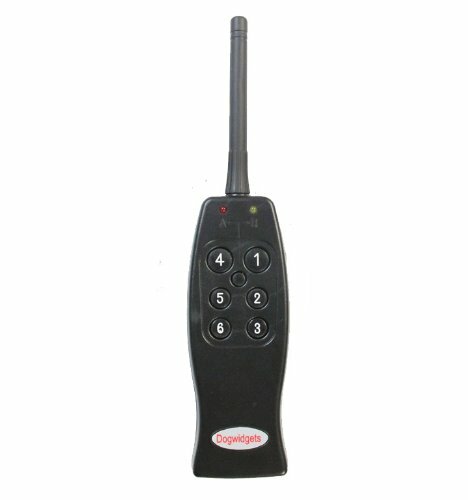 Replacement remote control for Dogwidgets DW-3. 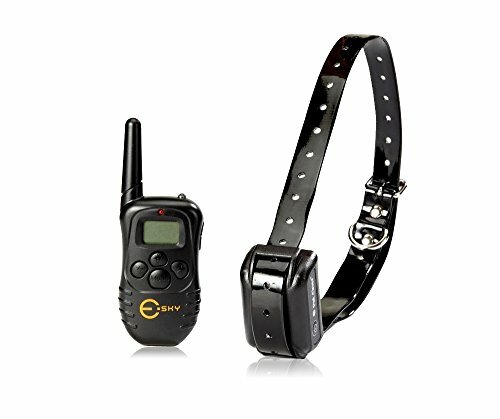 Best rated dog training collar with the simplest remote control 2 dog training collar operation. 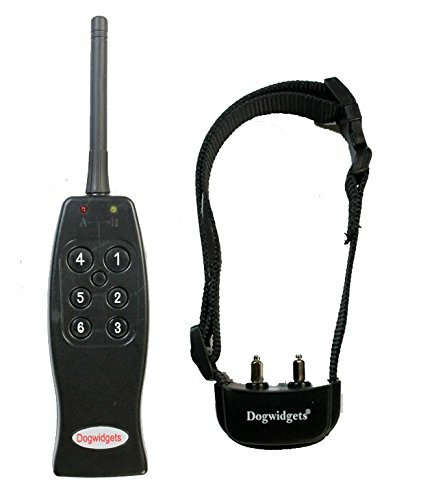 New model DW-1 dog training shock collar for 2 dogs by DogWidgets. Collars has 2 levels of shocks and 1 level of vibration and has 600 feet range. Collar will work with small, medium and large dogs from 6 to 100 lbs. You can train your dog individually with a shock and vibration or correct your 2 dogs at the same time with a vibration. Use this collar for basic training, potty training, biting, jumping on people, chasing cars, running away and barking. Very safe and humane. 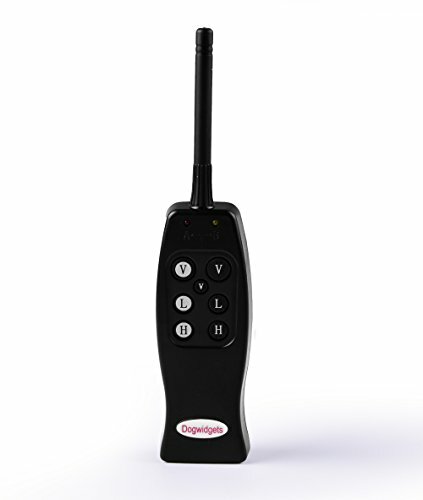 Product Features: Simple remote control operation with 7 buttons for shocks and vibrations. No need to toggle/switch buttons to give corrections to your 2 dogs. 2 levels of shock(Low and High). 1 level of strong vibration for each dog which stops dog's bad behavior 99% of the time. Correct each dog with a shock or vibration or correct both dogs at the same time with a strong vibration. The set contains: 2 collars adjustable from 6 to 24 inches long. 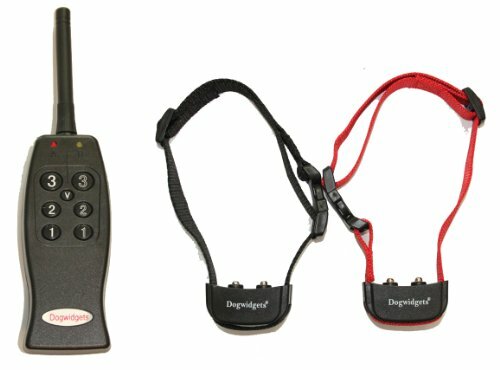 2 rechargeable collar receivers. 1 remote control(9-volts battery included). 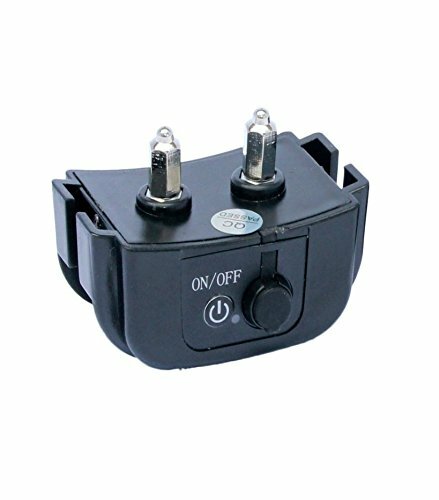 dual charger for the 2 collar receivers. 2 sets of rubber and metal prongs for the collars and 2 sets of long metal prongs for long haired dogs. 2 shock tester bulb and user manual. 30 day money back guarantee. 6 months replacement warranty and fast technical support from DogWidgets. 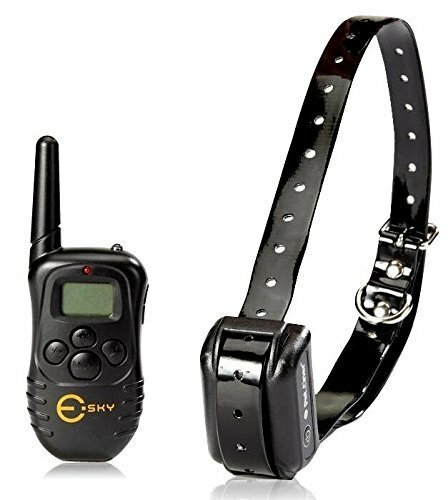 Please search B00LLU4BPS on Amazon for the upgraded version of this dog collar. 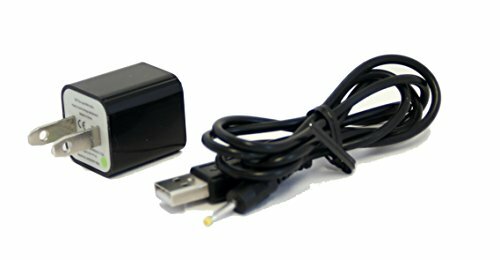 Replacement charger for Dogwidgets 2 dogs training shock collars.